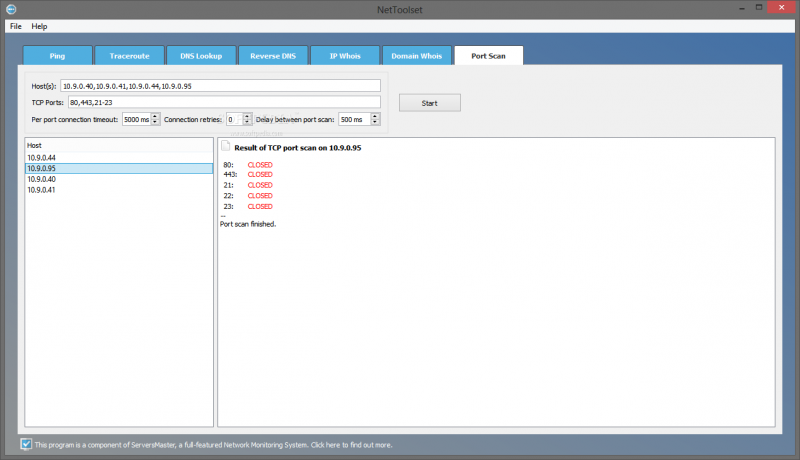 NetToolset is a free suite of admins' favorite network tools enhanced with some cool features. The toolset includes Ping, Traceroute+, DNS Lookup, Reverse DNS Lookup, Blacklist Lookup, IP Whois, Domain Whois and Port Scan. Tailored for network admins, the software is also suited for regular users, thanks to the easy to use interface. You can save results in HTML format, query multiple hosts at once, quickly import IPs and hostnames from any text or file. Target hosts are saved between application restarts to facilitate repetitive tests. The results of all tested hosts can be saved as a combined report in only one HTML file, making it very easy to share your results with 3rd parties. You can query multiple hosts at once using a comma separated host list, as well as quickly import IPs and hostnames from any external text or file (message headers, web pages, etc.). Target hosts are saved between application restarts to facilitate repetitive tests. You can easily test the same hosts in different tools. The Ping tool allows you to compare response times and packet loss for many hosts at one place. The Traceroute+ tool is an advanced combination of ping and traceroute. It returns ping-like statistics for each node in the path, which helps you to better nail down network utilization issues and have more detailed statistics than those returned by the regular traceroute. The IP Whois tool has many use cases. For instance, to track down the location of all IPs used to attack your machine, simply import your firewall's IP blacklist and trace them all in one click. The Domain Whois tool allows you to check the availability of many names in one run without any website ads or CAPTCHAs. The Blacklist Lookup tool is used to test hostnames or their mail servers with the well-known DNS based blacklist servers. You can easily add new blacklists or customize the default list. The Port Scan tool comes with a built-in list of well-known port designations, that let's you quickly select what kind of services you want to test without the need to remember their port number.